Does a Fireproof Safe Have Any Significance? What are the Features of a Fire Resistant and Fireproof Safe? What are the Different Types of Fireproof Safes? Is There Anything You Should Consider When Purchasing a Fireproof Safe? Recently, fireproof safes have been all the rage. Whether or not you’re familiar with fireproof safes, continue reading to learn everything you need to know before purchasing a fireproof safe! If you’re unfamiliar with fireproof safes, they’re basically safes that are fireproof. This is a phenomenal feature to have, especially in a safe. Let’s face it: some documents and items just aren’t replaceable. And while there’s a low chance that your house is going to burn down in flames, it’s better to be safe than sorry. That’s where a fireproof safe comes in. Since it’s fireproof, you won’t have to worry about getting to your safe to pull out your prized possessions in the middle of a fire. Instead, you can safely and quickly evacuate and wait until firefighters have the fire under control to look for your safe. A fireproof safe does have a significance and difference than its counterpart: a fire-resistant safe. Fire-resistant safes take into account the possibility of a fire occurring, but are not equipped with the necessary technology to completely protect itself and the items inside it from a fire for a long amount of time. On the other hand, fireproof safes are designed to withstand fire for a decent amount of time, approximately one hour to be exact. For reference, most home fires only last for approximately 20 minutes. Therefore, your fire should be put out before your safe loses its ability to withstand the fire. Like previously stated, a fire-resistant safe is designed to slow down the process of burning or prevent it altogether if the fire isn’t too strong and doesn’t last for a long time. Essentially, a fire-resistant safe is just a temporary solution. That being said, industry standards claim that it takes a lot for a fire-resistant safe to burst into flames. But, research shows that a standard house fire that lasts around half an hour would make a fire-resistant safe burn within minutes. On the other hand, a fireproof safe is designed to withstand flames for an extended amount of time, but not for forever. This is a good thing to keep in mind. There are three kinds of materials that manufacturers use to make fireproof safes. The first kind of material is insulite. Insulite is one of the newest and most modern materials that Schwann Corporation has been using. Although it is new and modern, insulite passes all of the industry standard tests of what makes a material fire resistant and even fireproof. Another commonly used material in fireproof safes is perlite. Perlite has been used for many years and is often used in other fireproof items. A similar material that is also used is known as vermiculite. Much like perlite, manufacturers have used vermiculite for a long time and commonly use it in other household items that are either fire resistant or fireproof. Like anything in life, there are a few things you should consider before purchasing a fireproof safe. 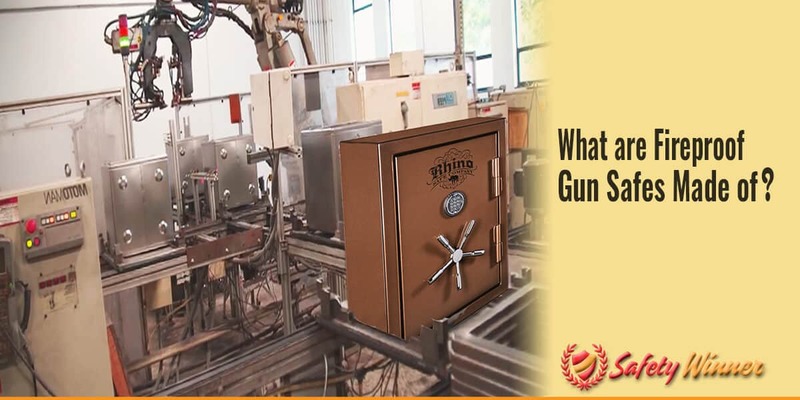 Firstly, don’t worry about the validity of effectiveness of a fireproof safe because each safe has to undergo a strict and intense inspection before being sold and marketed as a fireproof safe. This inspection typically involves forcing a fireproof safe to withstand extreme heat up to 1,700 degrees during a fire stimulation. Ultimately, if the safe is truly fireproof, then it should be able to withstand that extreme heat and fire for at least one hour. Another thing you should consider when purchasing a fireproof safe is the extra level of security and protection. Sure, a fireproof safe might be a little bit more money than a regular safe. But, it’s better to shell out a little bit of extra money now instead of limiting your budget and losing something you thought had infinite value in a home fire. There are a few misconceptions about fireproof safes. Just like we already briefly touched on, many people think that fireproof safes can withstand fire for an infinite amount of time. Unfortunately, this is not true. Typically, fireproof safes can withstand flames for approximately one hour. New and modern fireproof safes could potentially withstand flames for three or even four hours. Another misconception about fireproof safes is the idea that you can sue a company if the safe burns during a fire. This is true and false. For example, if your fireproof safe did not withstand the industry standard of one hour, then you have a basis for a lawsuit. But, if your fireproof safe hit the standard of one hour, regardless of the amount of time it marketed it could withstand fire, then you most likely don’t have a basis for a lawsuit. Overall, it’s important to understand the difference between fire-resistant safes and fireproof safes before you purchase either one. On one hand, a fire-resistant safe is meant to withstand extreme heat and flames for a small amount of time. On the other hand, fireproof safes should withstand extreme heat and flames for at least one hour. While new techniques and materials are emerging every day, insulite, perlite, and vermiculite are the three most commonly used materials to make fireproof safes. These materials are not only found in fireproof safes and meant to withstand extreme temperatures and flames, but they are also found in other fireproof objects, such as door and cabinets. If you have the opportunity to purchase a fireproof safe or at least a fire-resistant safe, then you should. After all, fire-resistant and fireproof safes are usually not too much more expensive than regular safes. So, take advantage of modern technology and the opportunity to purchase a fireproof safe and protect your most valuable possessions today!